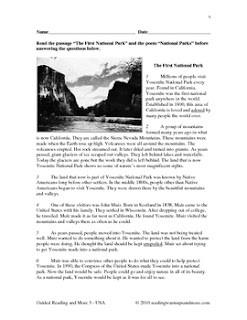 "The First National Park" / "National Parks"
This handout is intended for use by teachers and students in grade 3. Many states measure achievement in reading by assessing student progress on benchmark objectives identified in their state standards. This handout provides teachers with a fiction or nonfiction reading passage paired with poems to help assess student knowledge of reading objectives for students in grade 3. Instructions for using the selections as guided reading practice are included with this set of passages. They are designed to provide teachers with before, during, and after reading lesson plans to help guide students through the selections. The poem paired to a fiction or nonfiction passage has a similar theme or topic. Fiction passages include narratives and realistic fiction. Nonfiction passages include informational and content area selections. Multiple choice as well as short and extended answer questions follow each set of paired selections. Each question is designed to assess a specific reading objective. This set of passages can also be used as a stand alone assessment piece without the lesson plans. Students independently read and complete the passages and question items. The teacher can then either score the assessment passages apart from the students and report back to them as to how they performed or the teacher can score the passages in class together with the students allowing for immediate feedback and discussion. Included in this handout is an answer key. The answer key tells the correct multiple choice answers and examples of best-score short and extended written response answers. A scoring rubric for written responses is included in this handout as well. Also included in this handout is a bibliography if needed, a list of grade 3 reading objectives tested, acknowledgements, and a list of higher level vocabulary found in each passage.